It’s taken me a while to write this post. I was so ecstatic at finishing the cushions for our campervan late last year that instead of carefully chronicling how I’d made them, I’ve basically stood back and admired them. Before I started I read so many blogs and manuals explaining ‘how to make seat cushions’, I thought I should add my own version to the mix. So here goes. Whether you’re an experienced sewer or absolute beginner, the next two posts will give you step-by-step instructions and useful tips for making your own box seat cushions, to be used in caravans, boats, window seats, church pews – all sorts. Priests with hard wooden benches – take note! 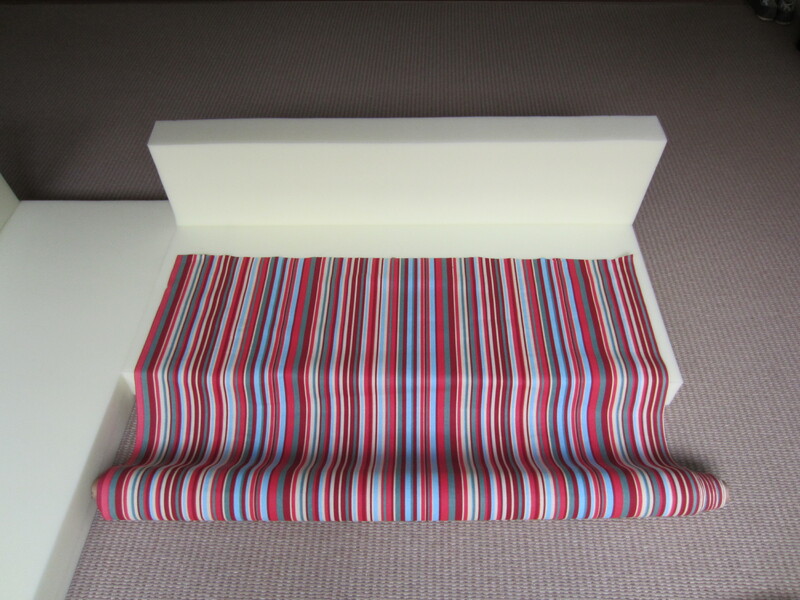 If you’re new to this blog, you don’t need to read any of my previous posts about making campervan seat cushions. You may find you start subconsciously stabbing yourself with your unpicker before we’ve even started (and you’ll be needing that later). If you have read this blog before, all I needed were some proper instructions! Before this project I had barely sewed more than a button, so in this guide I’ll assume you also have no previous knowledge. If you do, you’re half way there already! Part one (this blog) will cover all the materials you need to get started, and part two will cover the sewing instructions. zip long enough to match your cushion length and in a similar colour to your fabric. The longer your zip, the easier it’ll be to insert and remove your cushion. calico fabric for practice / templates. If you’re close to a Clark Rubber store, they will cut foam to your measurements. Otherwise if you’re confident with an electric meat carver, you can buy a foam camping mattress, mark on the measurements and do it yourself. (Note – it is MUCH harder carving foam in a straight vertical line than it is a roast pork.) 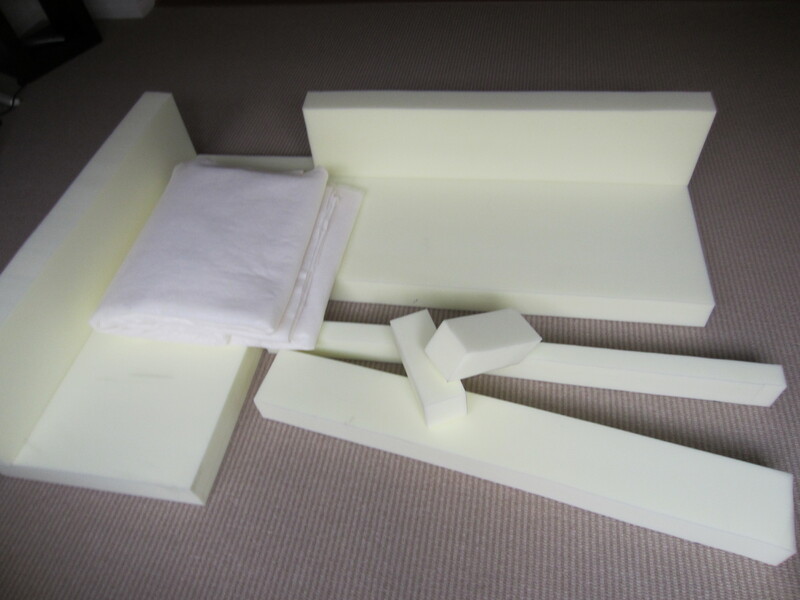 Whichever method you use, choose a high density foam – particularly if you’ll be using the seat cushions to convert into a bed or if they’re in high traffic areas. Once you have cut your foam to size, it’s a good idea to cover it in wadding, which will nicely soften the hard edges and corners. Spotlight and Lincraft in Australia sell various types, and as usual, you get what you pay for. I tried a couple of wool/polyester blends but found they were a bit bulky and wouldn’t stick well. My favourite was a 100% bamboo batting, which was a bit more expensive but so soft and easy to work with. If it’s hard to draw on the wool, just mark the corners. 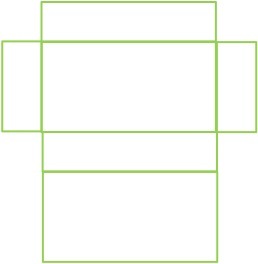 Then cut out the template. You can make it slightly bigger than the size of your foam but you don’t want too much overlap otherwise the bulges will show through your fabric (particularly if you’re using a wool/polyester wadding – the bamboo batting was a bit more forgiving). Lie the template over some newspaper and use a spray upholstery adhesive (from Lincraft, Spotlight, Bunnings etc) to spray the whole template first. 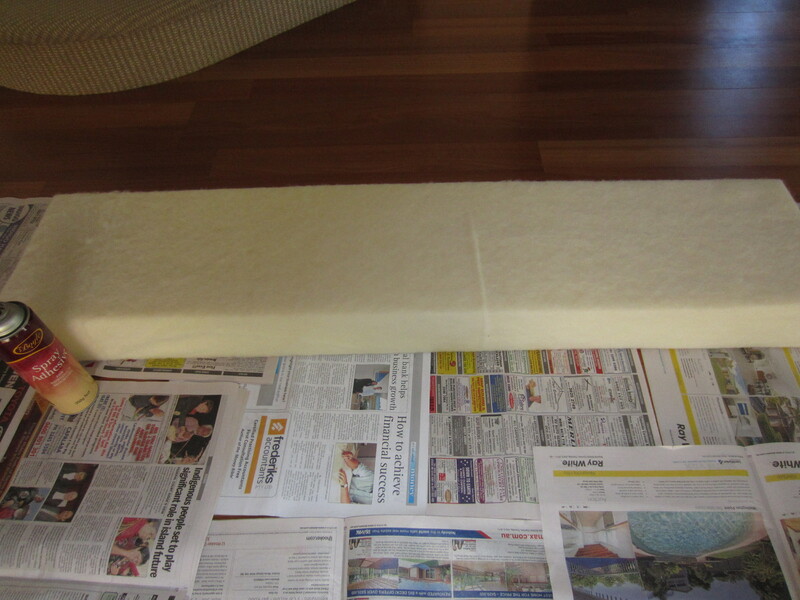 Then spray some extra adhesive on the foam itself and position it on the template. Then quickly fold all the sides up and over, smooth out any bumps and press firmly to stick. It should dry fairly quickly. If you have children, pets or pasta lovers around, some colours are more forgiving than others. Darker colours work better in an indoors/outdoors setting such as a caravan or campervan. If you choose a patterned or striped fabric, it’ll take a bit longer to cut the panels out to ensure all the patterns match up. Consider other colours in the area. 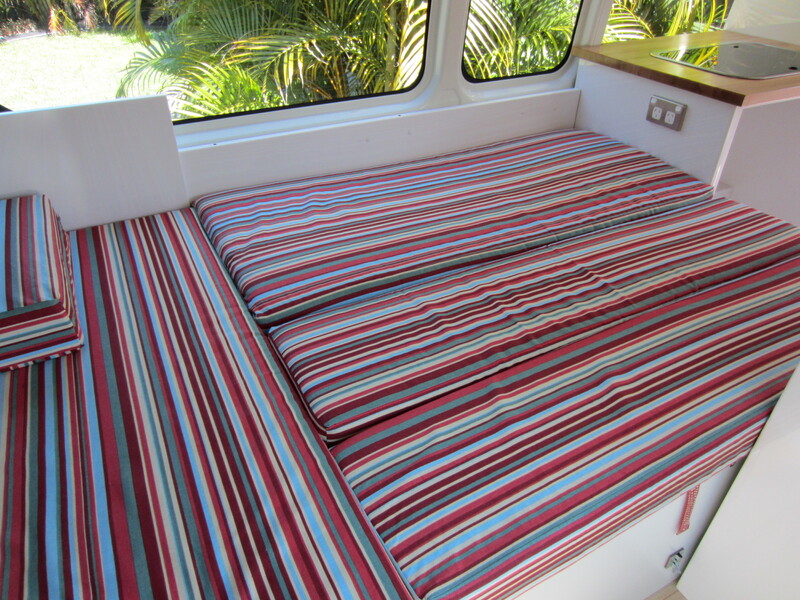 This sounds obvious but once we’d chosen the stripy seat cushions and red cupboard doors for our campervan, it was hard to choose a third complementary colour for the curtains. It’s worth getting a few swatches so you can mull over them. I found it useful to make a cardboard model of our seating arrangement to get an idea of how all the colours would work together. Each seat cushion needs 6 panels: top, bottom, front, back, left and right. Measure the length, width and depth of each cushion and add a 2cm seam allowance to each end. 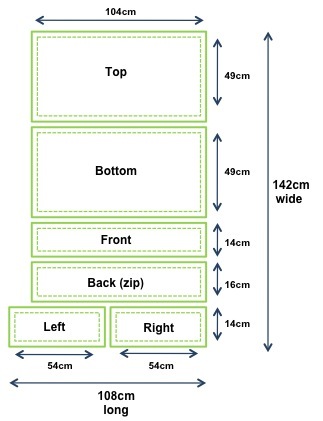 Note the back panel will be cut in half lengthways to form a seam for the zip, so add an extra 2cm to the seam allowance on the height measurement – 1cm for each half. It’s a good idea to draw a rough diagram of how you’ll cut each panel out of the fabric so reduce the amount of waste and offcuts. Fabric comes in a range of widths, and you can request the length you need. If the roll of fabric is 150cm (60 inches) wide, following the measurements above you’d need a length of 108cm times however many cushions you need to do in that size. If your roll of fabric measures less than 150cm, you’d have to play around with the configuration on your diagram. Bear in mind also that if your fabric has a bold pattern or wide stripe that you want to continue consistently around the front, back and sides, you may need to change your configuration. Once you’ve cut and covered your foam and you’ve chosen your fabric, it’s time to start sewing. See part 2 for the next instalment! This entry was posted in Building a diy campervan, Sewing adventures and tagged box seat cushions, campervan cushions, campervan seating, campervan upholstery, campervan upholstery fabric, caravan seating, caravan upholstery, cushion corners, foam for seat cushions, how to cover a seat cushion, how to make campervan cushions, how to make cushions for a caravan, how to make seat cushions, sewing instructions, wadding for seat cushions by Rach. Bookmark the permalink. This is a great idea to customize and, at the same time, protect the van seats from being battered easily. Great post by the way! I might try it out some time. I’m making seat cushions for our pews at church. They are old pews and are wooden. Do you have any suggestions of what to use on the bottom as the underside of the cushion, so they don’t slip? Thanks. Thanks for stopping by! I’d recommend making the cushions as normal using whatever material you’ve chosen and then adding velcro to the bottom to stop the cushions sliding around. You can sew one half of the velcro to the bottom of the cushion (maybe place a strip along each edge) and use the adhesive type to stick the other half of velcro to the bench. We’ve used it on some of our back rests – it’s strong enough to hold well and you can easily unstick the bottom half if needs be without ruining the bench. I would use the foamy-vanilla-colored-rubber-like mesh that is used as a non-slip, non-skid surface under rugs & runners. Hi Viva, yes that could work as well. We’ve used that in our cupboards to stop things moving around as we travel. Thanks! write a litte more on this subject? I’d be very grateful if you could elaborate a little bit more. Thanks! totally right. This post actually made my day. You cann’t imagine simply how much time I had spent for this information! Thanks! Thank You so much for Posting this…. I don’t Sew but my Husband does and because of your post I had the confidence that together we could do it ourselves. We just bought a Pop-up that is a 1980 Jayco and all original…. and I do mean all It was in Great condition however because of age when we took the covers off the beds they fell apart in my hands. Good news was the foam pads still had the original plastic wrap on so they were untouched by age. When I was looking on-line to buy covers and curtains the cost was about $1400. Then I cam across your blog and we were able to do it all for under $400. The best part is now it feels like only ours. So again Thank You. Now we can’t wait to take the family on a trip this summer. Can I use an overlocker to sew covers?… its what I bought without thinking… dumb I know. Hi – I’m not sure actually, I’ve never used an overlocker but I’d imagine a sewing machine might be easier to complete the whole thing. If anyone with better sewing knowledge can help, please feel free to comment – thanks! Thank you for a very nice tutorial. One of the best I have read online. I was wondering why your side panels are 54 cm long? The depth of your cushion is 45 cm and with the 2 cm seam on each side, it adds up to 49 cm. I hope you can help me, thanks! Thanks Mitch – enjoy making yours! I also was wondering why your side panels are 54 cm long? The depth of your cushion is 45 cm and with the 2 cm seam on each side, it adds up to 49 cm. I really don’t understand, but i know little about sewing…. Hi Peter, thanks very much for your comment. I’m afraid it’s several years since I wrote these instructions, and I can’t remember all the exact measurements. I know people have followed them successfully, so I presume there was a reason for that size difference – I’m just not sure what it was! Sorry I can’t help, good luck with your project. Rach and Paul of Campervan Converts built an L-shaped couch that converts into a bed that sleeps two. Rach made all of the cushions herself, and if you’re thinking that you need to be an expert seamstress to make couch and mattress cushions, you don’t—this was Rach’s first ever sewing project! Thanks, Rach, you did an amazing job on your cushions! I sure wish I had that talent.